At the first Sprint night at PyCon 2012, we ran into some trouble setting up Twisted in Windows. Since it has been a very long time since my original notes on how to develop Twisted in Windows, I thought I'd post an updated version. You know how to download files and install programs in Windows. That Python 2.7 is already installed. If not, the Boston Python User's group has a great wiki page on how to do so. That you are at least somewhat familiar with using command line, editing and running Python files, etc. If not, again the Boston Python user's group is a great resource. I did this in Windows XP, but it should be applicable to Windows Vista or Windows 7 as well. Useful tools you may want before you start this. 7-zip - Useful for decompressing bz2 and gzipped files tar files. Note: if you see a file like "file.tar.gz" or "file.tar.bz2", that means that it is "archived" twice - tar is a container for the files, and gzip and bzip2 compresses that tar container. Just wanted to clarify in case you unzip a "file.tar.gz" and get a "file.tar". Console2 - a nicer command prompt for windows - there doesn't seem to be an installer, just an executable in a zipped folder. Install MinGW, which is a GCC compiler for Windows. Download the mingw-get-inst installer. If it asks you for options, you may only need C, and C++, but I just installed everything, including Fortran, and ObjC. 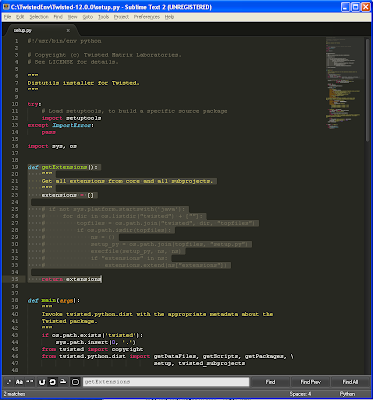 Install pywin32, which are the Windows extensions for Python. Downloadable files are under the tab "Files". Go to the latest build and download the build for your version of windows, for Python 2.7. Install the executable even if you have/are planning on installing virtualenv. I haven't figured out how to install it in a specific virtualenv, and I haven't been able to google up an answer. 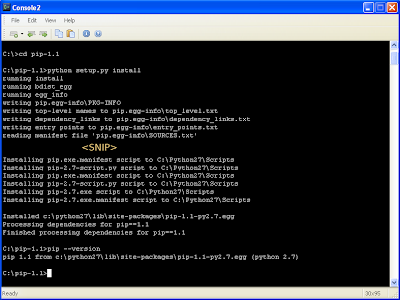 Install setuptools (which includes easy_install), which lets you install python extensions via running 'python setup.py' on source packages. Download the latest version for Windows that for Python 2.7 (download the .exe at the bottom of that page) and install it. 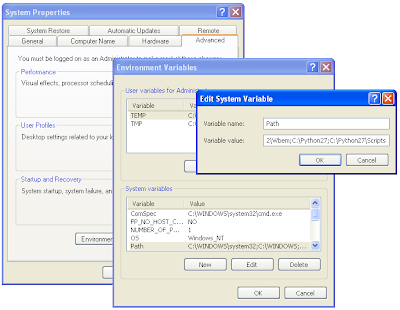 (if you haven't already added 'c:\Python27\Scripts' to your PATH environment variable (see the Windows Python setup wiki), do so. at the command line. If you don't get an error, then pip has been installed correctly. (In the screenshot, the 'SNIP' just means there was a lot more text that I cut out so as to fit the relevant bits in an image of reasonable size). 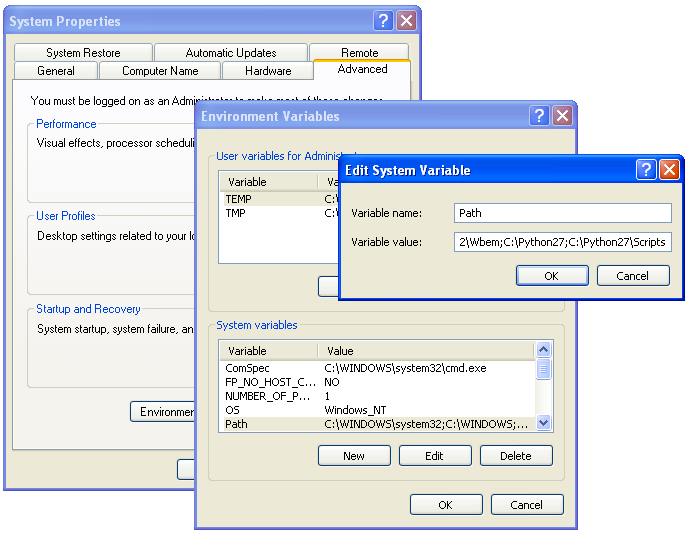 Virtualenv is something that creates isolated python environments. For instance if you want to work with different versions of packages such as Twisted or Django, it lets you set up environments that are independent of each other, so you don't have to edit your Python path to switch between versions, or do any other hacks. As far as I can tell it works well enough in windows, although some options are not available. If you haven't already installed pip, do so first. (You don't have to name your virtual environment "TwistedDev") Do not forget the "--system-site-packages" option, because otherwise pywin32 will not be installed in this virtual environment. Notice that the prompt now says (TwistedEnv) before the C:\. This means that you are now working in the TwistedEnv virtual environment. 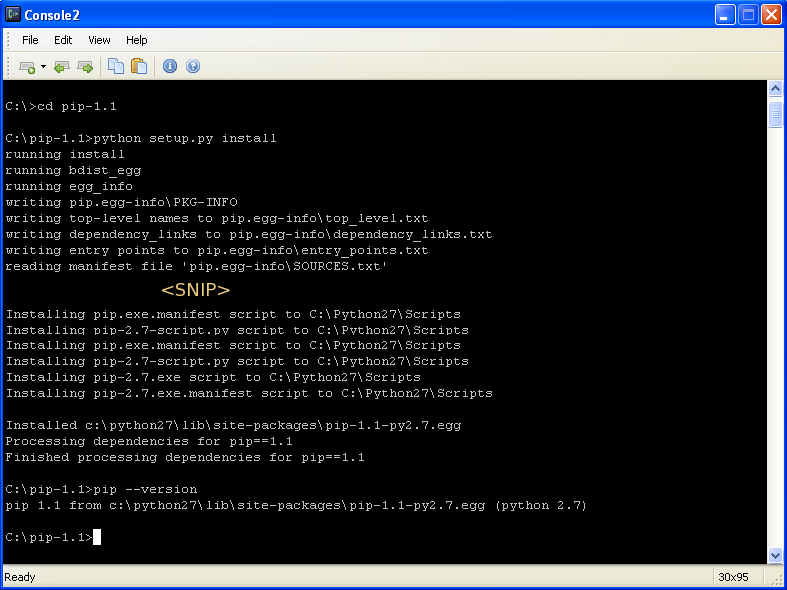 Once you are in this environment, if you use "pip install" or "python setup.py install", the python packages will be installed to the TwistedEnv\Lib\site-packages directory, rather than the C:\Python27\Lib\site-packages directory. Get Twisted. Go to http://twistedmatrix.com and download the source archive (make sure to not to download a windows installer). 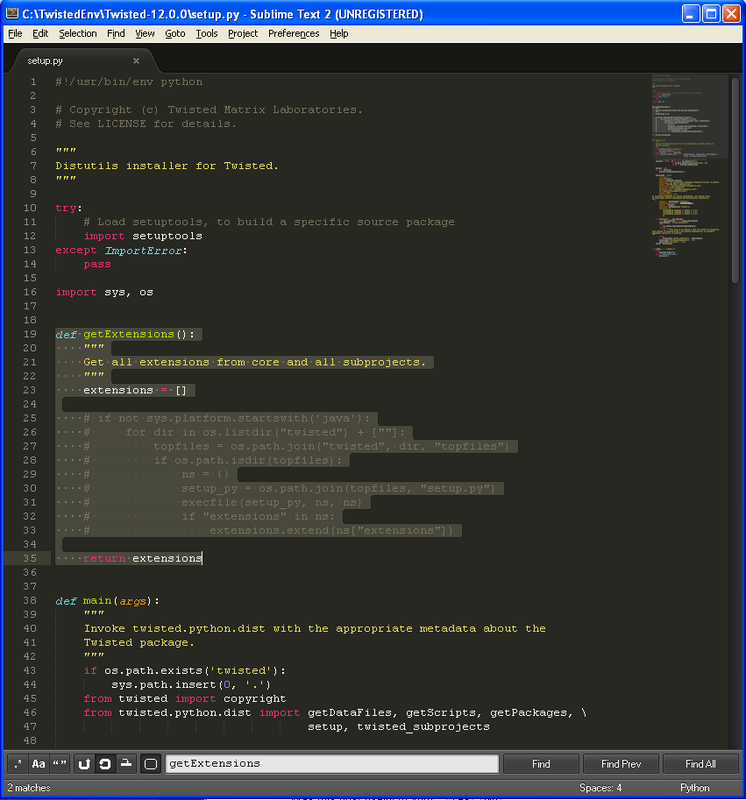 For more advanced users: check out Twisted from SVN instead. 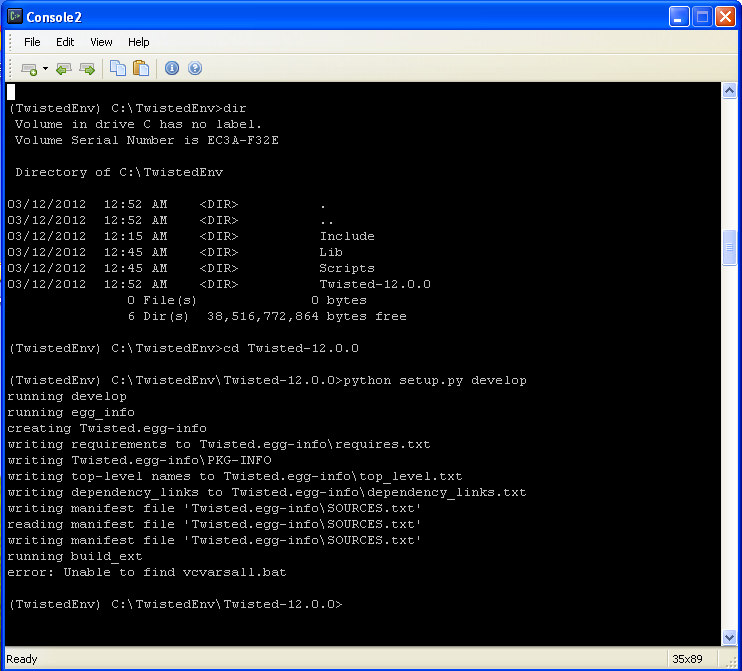 Save and extract it to C:\TwistedEnv\ (or wherever your twisted virtual environment is). If you did not/do not want to install virtualenv, then just extract it wherever (e.g. C:\). Usually the way to install it is 'python setup.py install', but that just copies the relevant files to your site-packages directory. You want to actually work on Twisted itself though, so using 'develop' basically just creates a link in site-packages to your source directory (C:\TwistedEnv\Twisted-12.0.0, or C:\Twisted-12.0.0 if you do not have virtualenv). You will probably see some vcvarsall.bat errors. This is because distutils\cywgincompiler.py uses a -mno-cygwin, which has been removed from the latest version of mingcw32. Make sure it installed correctly. Back out of your current working directory (the Twisted source directory) into your TwistedEnv directory (alternately, to C:\ if you did not install virtualenv), and try importing twisted. If twisted installed correctly, importing the twisted module will not raise any exceptions. Also note that the twisted module that is loaded is the one in your source directory. No seriously, this post is somewhat unfinished. I haven't explained how you'd work on different Twisted branches after running 'python setup.py develop', for instance, since I do not know the recommended way to do so. Someone at some point will probably write up something.